Lady Valet provides many and finite adjustments and has a foam backed nylon covering allowing for pinning. The Lady Valet dress form is the perfect partner for any keen sewer. The Lady Valet has a dark polished wood stand and matching neck cap. 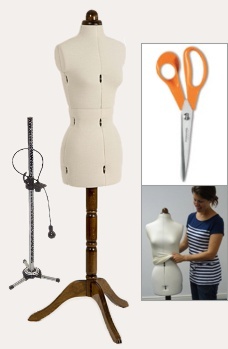 The dress form body comes ready assembled the wooden stand simply screws together. Supplied with easy to follow instructions and comes with a full 2 year guarantee on parts and labour - ideal for that birthday or xmas present.